PROCON Series 4 & 5 are designed and built to meet your needs for flow rates ranging from 115 - 330 gallons per hour at 250 psi. 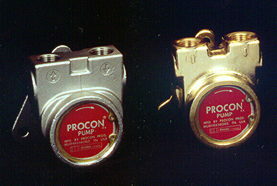 These PROCON pumps Maintain all the quality features and construction of our Series 1, 2, & 3 pumps. Bolt-on mounting style shown (left) clamp-on style also available. Dry Weight Approx. 4.5 lbs. Click Image (left) for enlarged view. Use browser "back" function to return here. Note: Specifications and dimensions are subject to change without notice.